She lived at Paris, FranceG.1 From 16 January 1929, her married name became Chetwynd. [S6] G.E. Cokayne; with Vicary Gibbs, H.A. Doubleday, Geoffrey H. White, Duncan Warrand and Lord Howard de Walden, editors, The Complete Peerage of England, Scotland, Ireland, Great Britain and the United Kingdom, Extant, Extinct or Dormant, new ed., 13 volumes in 14 (1910-1959; reprint in 6 volumes, Gloucester, U.K.: Alan Sutton Publishing, 2000), volume III, page 186. Hereinafter cited as The Complete Peerage. [S6] Cokayne, and others, The Complete Peerage, volume III, page 187. 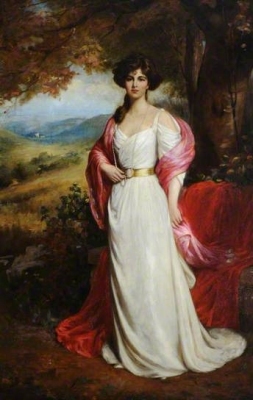 From 6 August 1851, her married name became Scudamore-Stanhope.1 After her marriage, Dorothea Hay was styled as Countess of Chesterfield on 19 October 1883. [S6] G.E. Cokayne; with Vicary Gibbs, H.A. Doubleday, Geoffrey H. White, Duncan Warrand and Lord Howard de Walden, editors, The Complete Peerage of England, Scotland, Ireland, Great Britain and the United Kingdom, Extant, Extinct or Dormant, new ed., 13 volumes in 14 (1910-1959; reprint in 6 volumes, Gloucester, U.K.: Alan Sutton Publishing, 2000), volume III, page 187. Hereinafter cited as The Complete Peerage. [S28] L. G. Pine, editor, Burke's Genealogical and Heraldic History of the Peerage, Baronetage and Knightage, 99th edition (London, U.K.: Burke's Peerage Ltd, 1949), page 978. Hereinafter cited as Burkes Peerage and Baronetage, 99th ed. Children of Henrietta Callender Grant and Sir Adam Hay, 7th Bt.